This is an interesting subject, and I want to go into detail here. First I want to start off by looking at the recent big companies that have signed contracts with the KRG and the success the kurds showed in the in the government formation. 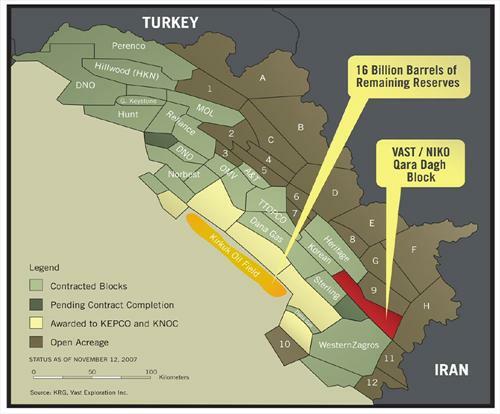 Estimated 45 billion barrels in the KRG. Along with another 36 smaller to medium oil companies. The technocrats at the Oil and Finance Ministries are expecting the same as they have recently included 100,000 barrels a day in Kurdish exports as part of their estimates for Iraq’s income in the 2011 budget. Another interesting thing is the oil exploration in areas outside the KRG which are apart of the disputed areas, which means they will be added to the KRG sooner or later (I assume this is the reason Baghdad was against the contracts). As you can see from the Image some of the exploration is happening outside the KRG. Turkey was against president talabani in Iraq and they lost again, I though they would have learned from their mistakes, I doubt it will have an impact on the ties though, as both sides rely on each other. Last edited by alan131210 on Sun Jul 08, 2012 3:18 pm, edited 2 times in total. Natural gas from the Kurdish regions of northern Iraq is unlikely to be exported to Europe via the planned Nabucco pipeline before 2020, according to London-based consultant Jennifer Coolidge Executive Director of CMX Caspian and Gulf Consultants. Last edited by alan131210 on Tue Apr 17, 2012 4:34 pm, edited 6 times in total. The Kurdistan Regional Government (KRG) continues to award and execute contracts of the new PSAs with a consortium of companies such as Korea's National Oil Corporation, Russian TNK-BP subsidiary Norbest, India's Reliance, Austria's OMV, US Gulf Keystone International Petroleum Limited (GKPL), MOL Hungarian Oil and Gas Public Limited, Korean Hillwood International Energy Company, and US Aspect Energy, as well as renew older PSAs to Turkish Norwegian, Cayman Islands and Canadian companies. In the interim, with the creation of the new KRG in August 2007, the Kurdish Natural Resources Minister is signing several new PSA contracts with international oil companies. A new petroleum law specifies Iraq's currently producing fields be developed by state-owned oil companies under the reconstituted INOC, while all other future fields by private companies through the contractual mechanism of production sharing agreements (PSAs), the mechanism favored by the oil companies. KRG through KEPCO received several blocks that in essence advanced plans for admitting IOCs as partners in the blocks, as KRG predicts the partners are necessary for providing technical and financial backing. Shares in Heritage Oil Plc (LSE: HOIL), the independent upstream exploration and production company with operation in Iraqi Kurdistan, were up more than 5% after the company issued an Interim Management Statement for the periond July 2010 to 17 November 2010.
is an independent company whose focus is on exploration in the autonomous Kurdistan region of northern Iraq. 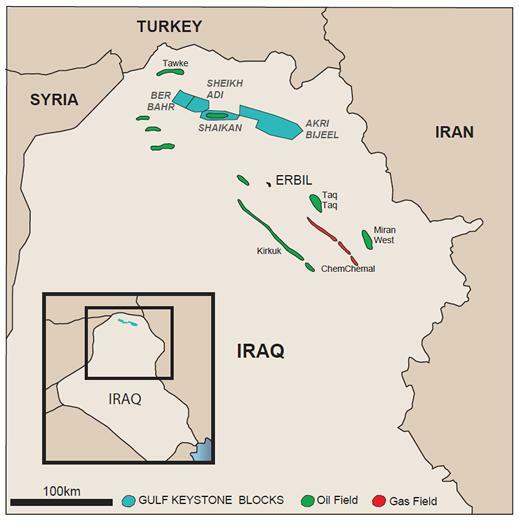 In November 2007 Gulf Keystone secured interests in two production sharing contracts in the Kurdistan Region of Northern Iraq, Shaikan and Akri-Bijeel. In 2009, the Company diversified the asset base in Kurdistan with the addition of two new Production Sharing Contracts, Sheikh Adi and Ber Bahr. This region has the potential to be a world class hydrocarbon province and Gulf Keystone believes it is well positioned to seek out further growth opportunities. Gulf Keystone is quoted on the Alternative Investment Market (AIM) of the London Stock Exchange. Ticker symbol GKP. • Regional diversification into high impact exploration / appraisal opportunities. 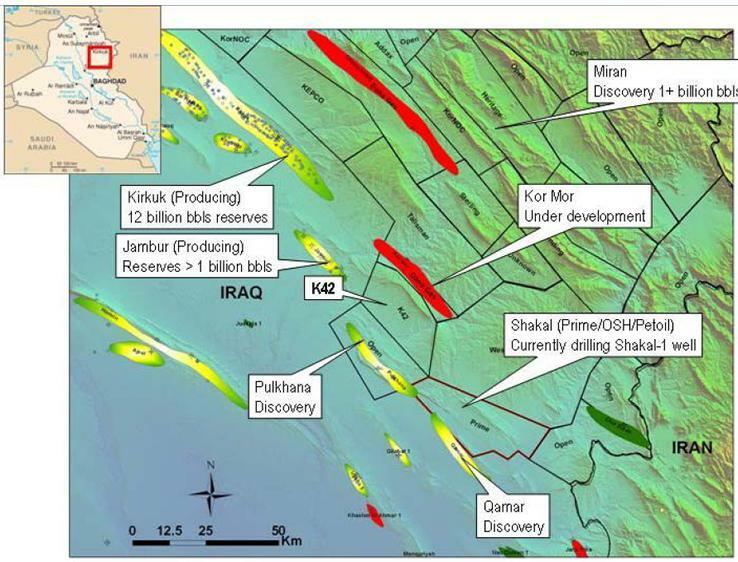 Oil Search has signed a Seismic Option Agreement with the Kurdistan Regional Government (KRG), over Block K42 in Iraq. The K42 Block, which covers 511 sq kms, lies in the south-eastern fairway of the Zagros Fold Belt of Kurdistan, adjacent to the Pulkhana discovery and the Kor Mor gas condensate field, which is currently under development. The K42 Block has not previously been drilled, but is thought likely to contain the highly productive Cretaceous and Tertiary intervals present in the region and therefore has the potential to contain material reserves. Under the agreement, Oil Search will acquire 200 kms of 2D seismic. These seismic acquisition activities, which Oil Search will operate and fund 100%, are expected to commence within the next six months. Oil Search then has an option to sign a full Production Sharing Contract (PSC) on agreed terms, should the results of the seismic data be encouraging and if other conditions precedent are met. Should the Company elect to enter a PSC, its working interest will be 60%, paying approx. 75% of the Minimum Work Programme costs (one well). Oil Search’s Managing Director, Peter Botten, commented: 'This seismic option agreement in Block K42 provides Oil Search with an opportunity to expand its presence in a highly prolific fairway. It is in line with Oil Search’s strategy to focus on licences that have material hydrocarbon potential, as Block K42 has an excellent address in a world class hydrocarbon province. Several companies have announced large new discoveries in this highly prospective region and oil exports have recently commenced from the Tawke and Taq Taq fields. The option allows the Company to reduce subsurface risk prior to taking on drilling commitments. Knowledge gained from our past non-operated ventures in the region will be applied to Oil Search's first operated venture in Kurdistan. Oil Search is extremely pleased to be operating in Kurdistan and is looking forward to bringing both its PNG Fold Belt expertise and community affairs skills to the K42 venture. Longford Energy Inc., is a junior Canadian oil and gas exploration and production company. Longford has acquired a significant interest in the Chia Surkh Block Production Sharing Contract in the Kurdistan Region – Iraq. The Block offers both a field development opportunity and multiple exploration prospects. Addax Petroleum Corporation (ADXTF.PK): Addax has a 45% working interest in Taq Taq, a currently producing oil field, and another 26.67% interest in the Sangaw North PSC. Starting June 1st, 2009, Addax began exporting oil from Taq Taq, a historic event for Kurdistan. halliburton.gifThe decline in Iraq's oil industry and the delay of exportations is likely due to the managerial deficiencies such as the hiring of US Halliburton subsidiary Kellogg Brown & Root (KBR) without a tender to rehabilitate southern Iraq and pipelines carrying water to oilfields in southern Iraq in the Qarmat Ali Water Plant. The contract did not include the repair of the pipelines carrying the water to the oilfields, therefore the water was pumped into the ground and old pipes burst, spilling large amounts of water into the desert as well as farmers tapping the water pipes in order to irrigate fields. Then, the Army Corp of Engineers had the responsibility for rebuilding oil pumps and pipelines and they admitted they did not have oil production experience. The KRG and KBR then signed a USD 70 million contract to rehabilitate part of the pipeline system, however, KBR was only able to fulfill half of the contract, thereby preventing a couple of million barrels from being transported that had to be re-injected into the ground, a practice which is harmful to oilfields. DNOCoLogo.JPG Remarkably, an oil find documented in 2005 in northern Iraq by a small Norwegian company DNO expects to use trucks with a capacity of about 15,000 barrels per day (bpd) to bring the crude to the Iraqi domestic market for refining. However, delays in passing the petroleum law as well as insurgency and crime likely have prohibited exportation of this oil. Oil companies that have signed deals with Iraq's ambitious and mostly independent northern KRG region have subsequently had conflicts with INOC in Baghdad which has caused disagreements between the northern and central regions. These conflicts are likely complicating the deals made by the KRG. REL.jpgOn 8 November 2007, the KRG signed new PSAs with India's Reliance, who won two contracts for the Rovi and Sarta blocks. Reliance is investing USD 15.5-17.5 million for the two blocks that could likely hold one billion barrels of oil reserves. Under the terms of the contract, Reliance Exploration & Production, DMCC, a wholly owned subsidiary of RIL, will serve as the operator. omv.gifOn 6 November 2007, Austria's OMV was awarded with two PSAs in the Mala Omar and Shorish blocks, through its 100% subsidiary OMV Petroleum Exploration GmbH. The signed PSAs for OMV as the operator of exploration blocks with the KRG covers approximately 800 square kilometers and location is in the vicinity of Erbil, the capital of the Kurdistan Region of Iraq. Work on these blocks will likely start sometime in 2008 with the acquisition of 2D seismic technology followed by the drilling of an exploration well in each block over the next three years. On 7 November 2007, Gulf Keystone International Petroleum Limited (GKPL) signed a PSA as operator for the Akre-Bijeel block with the KRG. The PSA is divided as GKPL 75%, Kalegran 20% and Texas Keystone 5%. Gulf Keystone will carry Texas Keystone's 5% share of initial costs and expenses prior to drilling the first well. The planned activity includes the acquisition, processing and interpretation of 100 kilometres of 2D seismic and the drilling of one exploratory well, and are in line with the terms and conditions published by the KRG. GKPL is a US (Texas) independent oil & gas exploration company, Kalegran Limited, is a subsidiary of MOL Hungarian Oil and Gas Public Limited Company (MOL). The PSA is for exploration, development and production of hydrocarbon resources in the Shaikan Block in the Dihok area of the Kurdistan Region in Northern Iraq. Location of the Shaikan Block is approximately 85 kilometers Northwest of Erbil and covers an area of 283 square kilometers. TNK.jpgNorbest Limited a subsidiary of Russian TNK-BP signed for four blocks of the Hawler contract area consisting of 1,532 square kilometers in Erbil Governorate. The Hawler area comprises blocks K11, K12, K14, K15 and is considered to be low to medium exploration risk areas, likely defined as high to medium profitability area. KNOC.jpgKorea National Oil Corporation (KNOC) signed the Bazian block consisting of 473 square kilometers in the Sulaimani Governorate. The consortium of the Korean NOC consists of: SK Energy Company, Limited, Daesung Industrial Company, Ltd., Samchully Company, Ltd., Bum-Ah Resource Development Corporation, UI Energy corporation, GS Holdings Corporation and Majuko Corporation with the area in Iraq considered to be a low exploration risk area, likely defined an area likely to be profitable. 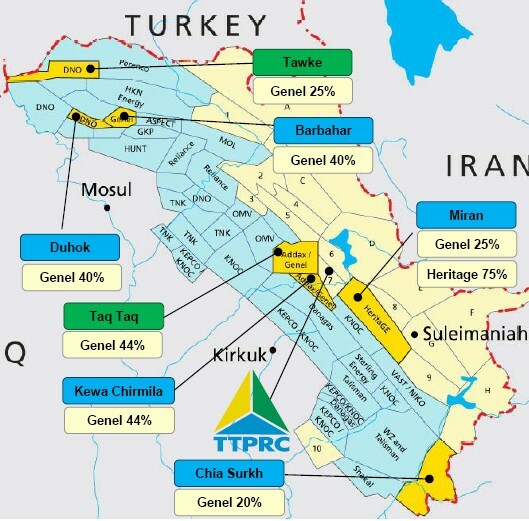 The other four PSAs went to Korean Hillwood International Energy Company the Sarsang block in Duhok Governorate with the area considered a medium exploration risk area; UK-based Sterling Energy the Sangaw North Block, consisting of 492 square kilometers in Saulaimani Governorate and considered a low exploration risk area; and finally Aspect Energy, LLC, described as a US-based company from Denver, CO, awarded the Atrush block considered to be a low exploration risk area. The KRG also renewed five older PSAs to Turkey's Genel Enerji and Toronto-listed Addax Petroleum; Canadian Western Zagros; Cayman Islands Hawler Energy and A&T Petroleum; and Shakal, Trilax and Turkey's Petroleum and Petroleum Products International Exploration and Production Incorporated (PETOIL) to bring the deals in line with the Kurdish law for Norway's DNO (previously mentioned), and a service contract to government-owned Kurdistan National Oil Company (KNOC). KNOC will likely develop the Khurmala field with peak estimated output of 250,000 bpd, and build a 50,000 refinery to supply natural gas and fuel oil for power generation. The week of 17 December 2007, the kurdistan Regional Government and Ergil, a Turkish storage tank construction and service company, secured an oil terminal construction of Suleymania Fuel Storage Tank Project. Ergil sets up secure environments in high risk countries, and this is the first post-war oil storage terminal investment in KRG's reconstruction initiative. Last edited by alan131210 on Sat Jan 29, 2011 2:58 pm, edited 7 times in total. A pair of Emirati energy companies producing natural gas in Iraq's northern Kurdish region said Tuesday they expect to boost the output capacity there by 50 percent within two years. In an update marking two years of production in the self-rule Kurdish region, Dana Gas and Crescent Petroleum said they are currently able to pump 200 million cubic feet of gas per day. They expect that level to rise to 300 million cubic feet daily by 2012. Existing production of between 160 million to 180 million cubic feet daily is used to power two regional electricity plants, in Irbil and Chemchemal, according to the firms. They say they have invested $850 million in the project so far. That included building a 110-mile (180-kilometer) pipeline across mountainous terrain, which at times required them to clear areas riddled with land mines. The Sharjah-based companies highlighted the support provided by the regional Kurdish government, which has been successful in attracting foreign business to its region. But many of those deals have caused friction with Baghdad because they often bypass the oversight of national ministries. Crescent's executive director, Majid Jafar, said the Emirati companies' projects have delivered tangible benefits to the country by boosting the north's electricity supply -- a service that remains spotty and scarce in much of the rest of Iraq. "This shows what can be achieved by the private sector, even under difficult circumstances, when the right policies and investment framework are adopted," he said in a statement. Dana Gas and Crescent hope to eventually produce enough gas for export. The companies last year signed a deal with Austria's OMV AG and Hungary's MOL to export gas from the Kurdish region as part of an $8 billion project. Some of the gas would be directed to the planned Nabucco pipeline linking Turkey to central Europe, expanding the continent's energy supply options. Iraq's Oil Ministry has called that deal illegal because it doesn't carry Baghdad's approval..
Last edited by alan131210 on Sat Jan 29, 2011 3:18 pm, edited 2 times in total. Following completion of deepening and testing of the Miran West-2 well, Heritage management estimates that the well has P90-P50 gross in-place volumes of gas of between 6.8 and 9.1 trillion cubic feet (TCF) with 42 to 71 million barrels of condensate and between 53 and 75 million barrels of oil. Buckingham estimated that Heritage will achieve the first production of oil and gas from the well in 2015. “This discovery has the potential to generate substantial further value for our shareholders and benefit the people of Kurdistan and Iraq,” he said. Last edited by alan131210 on Sat Jan 29, 2011 2:59 pm, edited 1 time in total. Gulf Keystone Petroleum (LON:GKP) shares climbed around 5 percent after it confirmed that the Shaikan-3 appraisal well had been completed in Northern Iraq. Shaikan-3 in Kurdistan has been completed as a production well from the Jurassic reservoirs in the Sargelu formation – just like the nearby Shaikan-1 well. Importantly the well is designed to test the shallow Cretaceous intervals, which could not be properly tested in Shaikan-1. To this end Shaikan-3 proved successful. The well defined the lower portion of these Cretaceous intervals - known as the Garagu resources – between 1,060 and 1,157 metres. Gulf Keystone puts the Garagu oil in place volumes between 220 million and 2.2 billion barrels (P50 – P10), following two separate flow test on Shaikan-3, and based on the previously gathered data. The ‘P range’ relates to the probability of the volumes estimated. So P50 represents a 50 percent probability that the actual volumes in the ground will equal or exceed the estimate, whereas a P10 estimate would have a 10 percent chance. The news prompted a fairly modest rally on London’s AIM market, with shares adding around 8.5 pence to trade at 172 pence per share. The fact that such a discovery, which GKP chief operating officer John Gerstenlauer described as ‘massive by any standard’, prompts a mere 5 percent rise suggests the latest update had been widely anticipated. The threat of litigation by former partner Excalibur Ventures has recently unsettled investors, though GKP is confident it will see off the challenge. That said, the news from the ground has been uniformly upbeat. The initial Shaikan-1 well propelled Gulf Keystone to become one of the most talked about, and invested in, stocks on London’s AIM market. Shaikan-1 tested five levels from 1,450 metres through to 2,850 metres - with a combined rate of more than 20,000 of oil barrels a day. Based on the results from the initial Shaikan well an independent report was compiled. It put Shaikan’s oil in place resources at around 1.9 billion barrels and saw upside to 7.2 billion (P90 - P10). However it could not properly test either the shallower Cretaceous or deep down to the Permian – at around 5,000 metres. GKP recently began a comprehensive work programme to fill in these gaps. With Shaikan-3 testing the shallow reservoirs in the immediate vicinity of Shaikan-1, meanwhile work on the Shaikan-2 deep-appraisal well began in December 2010. Shaikan-2 will take 6 months to drill to a depth of 5,000 metres. Richard Nolan, equity analyst at Daniel Stewart, highlighted that GKP successfully achieved its goal with Shaikan-3. “Considering the proximity between Shaikan-1 and Shaikan-3 compared to the lateral extent of the Cretaceous we view the fact that they encountered significant volumes as positive and are optimistic about the volume estimate range and its potential upside,” Nolan said in a note to clients. Meanwhile Evolution Securities oil analyst David Farrell stressed that the Garagu resources represent an incremental addition to the Shaikan discovery – although he has a more conservative view on the level Garagu’s recoverable resource. The analyst also noted that he would have liked more information, relating to detail on the flow test rates, oil viscosity or quality (API). “Our assumed P50 recoverable resource estimate of 66 million barrels for the Cretaceous Garagu formation is hardly transformational for the Shaikan story but is an incremental addition,” Farrell said. Lionel Therond, oil and gas analyst at Fox-Davies, described it as a positive result that adds up to the existing resources estimates for Shaikan-1. “A positive result that adds to the 4.2 billion barrel existing oil in place estimate based on the Shaikan-1 discovery well,” Therond said. The clear message that sticks out from analyst coverage is that the range of the P50-P10 estimate for Garagu is wide to say the least. Indeed GKP say as much in this morning’s statement. According to Gulf Keystone, the large spread between the P50 and P10 volumes relates to the uncertainty regarding the exact nature of the Cretaceous reservoirs down dip, on the flanks of the Shaikan structure. “If the Cretaceous is oil bearing near the flanks, then the P10 volumes become more likely and it is possible that the oil will also be less viscous and of higher API gravity,” the company said. GKP, and its partners, will now formulate a development plan for the Garagu resources. OSLO, Jan 28 (Reuters) - Norwegian oil company DNO (DNO.OL: Quote) said on Friday it had struck oil in an unexplored area of Iraqi Kurdistan south of its prized Tawke field. DNO International ASA spokesman Tom Bratlie said oil flow from a well called Bastora-1 near the Kurdish capital of Arbil was "encouraging" as the company awaits word on an Iraqi political settlement that would permit it to begin exports. "The first two tests would only flow water," he said. "But in the third test, which is now going on, we have been able to flow oil to the surface and at the moment we are taking measures to try to stabilize the flow." He added: "It is of course encouraging to find oil and to be able to bring it to the surface, but at the moment it's just too early to try to provide any more details." This is great news. I just hope that we as Kurds can take advantage of this oil money to help us advance as a nation rather than merely becoming reliant on oil as a source of revenue. Look at Israel. It is much stronger than any other country in the Middle East because it has developed its human resources rather than its natural resources. They have done things like plant thousands of hectares of forests and transformed areas of the desert into green spaces. They have developed the best universities in the Middle East and have some of the most advanced scientific communities in the world. They have the highest human development in Asia excluding Japan and South Korea. So please, I appeal to all Kurds, let's not become another petro-state. Let's develop our minds, our schools, our universities, and our people. Let's create an open society that fosters development and progress. Let's not become the next Dubai. Let's become the next Norway--another energy-rich nation but also one that has a diversified economy with the highest human development in the world. HOUSTON, April 13 (Reuters) - Marathon Oil Corp (MRO.N: Quote) said on Wednesday it discovered oil at a well in the Kurdish region of Iraq. The Houston company said it has a 20 percent interest in the Atrush block where the successful well was drilled. Marathon said in October it had taken a stake in four exploration blocks in Kurdistan, marking the U.S. oil company's first entry into Iraq. Dohuk, April 20 (AKnews)- The mayor for Atrush district said that oil has been discovered in a village around Atrush, in Dohuk province of the Kurdistan Region (northern Iraq). Nashwan Husni Othman told AKnews that in Mghara village an oil well has been discovered. He expected the well to be very “large”, though so far oil is not pumped out of the well. In Balata village though the excavation has been underway for a while, no wells have been discovered. The process will continue, however, the official said. Provisions are set to conduct query for oil in Barebere village, too. The US-based Marathon Oil Group will take 20% of the oil revenues for discovering and pumping oil from Atrush area, which is presumed to be rich in oil. PNA – Erbil, Kurdistan - Wolfgang Ruttenstrofer, the Austrian Oil Company has decided to transfer liquid gas to Europe from Kurdistan region. In a gathering with Kurdistan parliament speaker Dr. Kamal Kirkuki, Chairman and Chief Executive of Austrian Oil and Gas Group (OMV AG) Wolfgang Ruttenstrofer highlighted his company’s prominent role in Europe in terms of oil transfer. Wolfgang Ruttenstrofer underlined Kurdistan strategic position and pointed out that his company will undertake a part of an exploration project through Kurdistan on which it is highly skilled. Kurdistan parliament speaker expressed his willingness for the project and stressed bilateral ties between two countries in all aspects. The Kurdistan Regional Government said today it has received notification of a first oil export payment from Baghdad as the semi-autonomous region inches closer to resolving a long-standing dispute over payments to international companies. “KRG has received a written notice from the federal Ministry of Finance in Baghdad, confirming release of the first oil export payment to the KRG contractors,” Prime Minister Barham Salih said. Kurdish exports from two fields -- Taq Taq and Tawke -- flowed briefly in 2009 but were halted when the Iraqi government refused to pay the oil companies working the fields, including Norway's DNO and Turkey's Genel Enerji. It rejected the legality of the contracts signed by the Kurds without central government approval. Earlier this year the two sides agreed a compromise and exports restarted from the region. Iraq agreed to pay companies their exploration and development costs, but not their profits. KRG’s oil exports are now believed to be running at around125,000 barrels per day. “The payment is part of the recent interim agreement on revenue allocation reached by the KRG with the federal Prime Minister Nuri al Maliki and the federal Ministers of Oil and Finance,” said Salih. Shares in DNO rose 15.07% on the news and traded up at Nkr8.4 at 17.04 CET on the Oslo Stock Exchange. Norwegian oil firm DNO, among the first to operate in Iraq after the fall of Saddam Hussein, said Wednesday it would finally receive payment for crude oil exports from the Kurdish area of Iraq. The overdue payment is made possible by a recent agreement between Baghdad and Kurdish authorities. "A first cash advance to DNO of 110 million dollars has now been confirmed by the Kurdistan Regional Government and forms a basis for increased activities by DNO in Kurdistan going forward," DNO managing director Helge Eide said when presenting the group's quarterly earnings. DNO has been present in Iraqi Kurdistan since 2004. Its activities in the autonomous province had been troubled by a long dispute Baghdad and authorities in Kurdistan, which have argued over payments, revenue sharing and the central government's refusal to recognise Kurdish oil contracts. The company started exporting crude oil from the Tawke field in 2009 but suspended exports shortly afterwards because it had not been paid. Exports restarted in February this year following an agreement between the two sides whereby Baghdad agreed to pay for the expenses of oil companies working in the region. Last week, Baghdad finally transferred 243 million dollars destined to payment for oil companies operating out of Kurdistan. This "amounts to around 50 percent of net revenues derived from the export of over five million barrels of oil from the Kurdistan Region between the start of February 2011 and March 27," Kurdish Prime Minister Barham Salih said in a statement. The Tawke field currently produces some 65,000 barrels a day, DNO said Wednesday. The deal between Baghdad and the KRG came too late for DNO to include the Tawke field revenue in its first quarter earnings, it said. The company lost 65.4 million kroner (8.3 million euros, $12.0 million) in the first quarter, down from a 14.8 million kroner net profit for the same period last year.